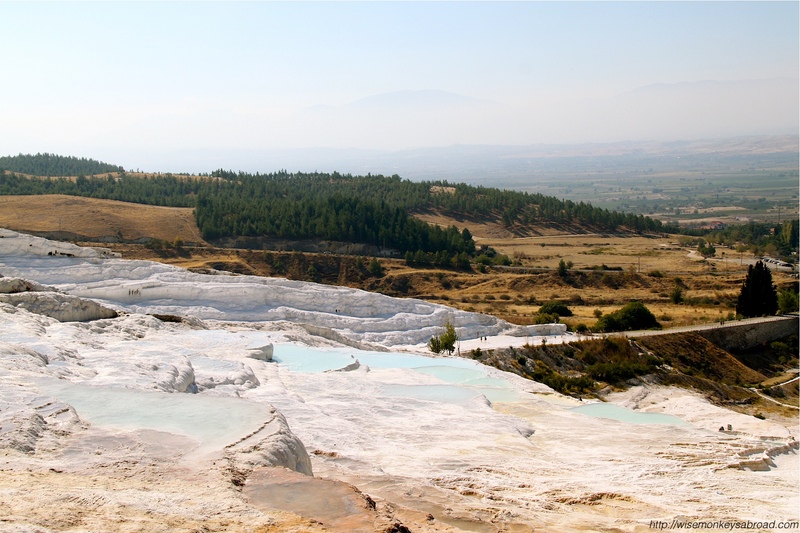 The turquoise water in the white pools of Pamukkale has always been a major drawcard for us to visit Turkey. 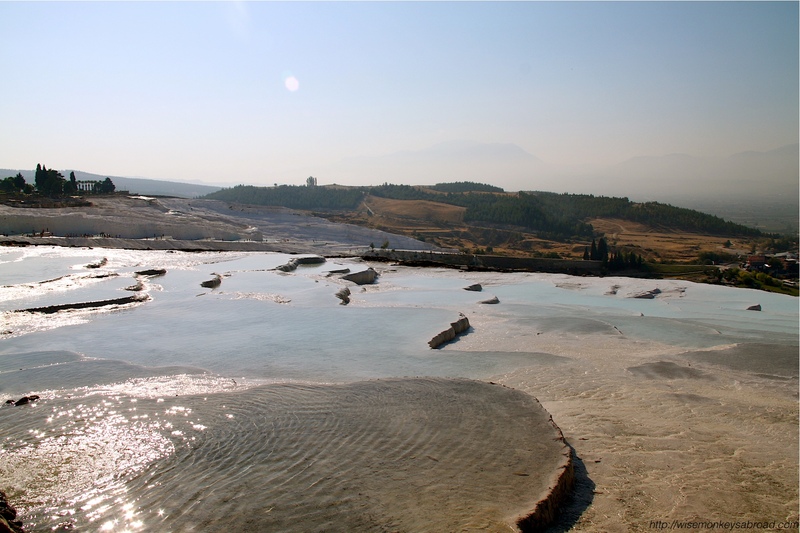 The travertine pools and terraces always looked so magical. We knew we had to see them. The day we visited, the temperature was well into the 30s (Celsius). The glare of the sun was blinding as it bounced of the limestone and the heat was staggering. In our haste to take photos and begin exploring the site, we were not concentrating on where we were walking and both stepped into a muddy, sludgy spot along the boardwalk. We probably don’t need to describe much more because everyone should know what thongs (i.e. flip-flops) in mud equals, right? An impeding ungraceful flailing of arms to steady ourselves; Le grabbing onto David, David almost losing his balance and then so forth and so forth. A scene from a black and white Charlie Chaplin film comes straight to mind as to how we must’ve looked. After what felt like a lifetime of erratic arm movements to steady ourselves, but probably only 20 seconds in reality, we escape the mud traps. Only to then have to walk along a wooden boardwalk with what felt like glue on the soles of our feet! Off came the footwear as we made a beeline for the travertine pools. It was a welcome relief to be able to dip our feet. Wading through knee-deep hot spring water felt simply refreshing until we almost slip on the uneven, slimy floor of the pools. Looking around, we felt like the two most uncoordinated people on land and now in water. It didn’t bother us…. On we walked through pool after pool. We gave up on photographing by this stage because the entire experience had become “awkward” to say the least. Us juggling our hat, sunglasses and our backpack while we tried to stay upright would just end up with our big camera going for an unwanted dip in the hot springs. It was from this experience we decided to get ourselves a really awesome compact camera for these type of situations. The experience was slightly less magical than we envisaged but we still enjoyed our time at Pamukkale and were glad to have visited. Although the pictures we captured are hardly anything like other photos we’ve seen…. 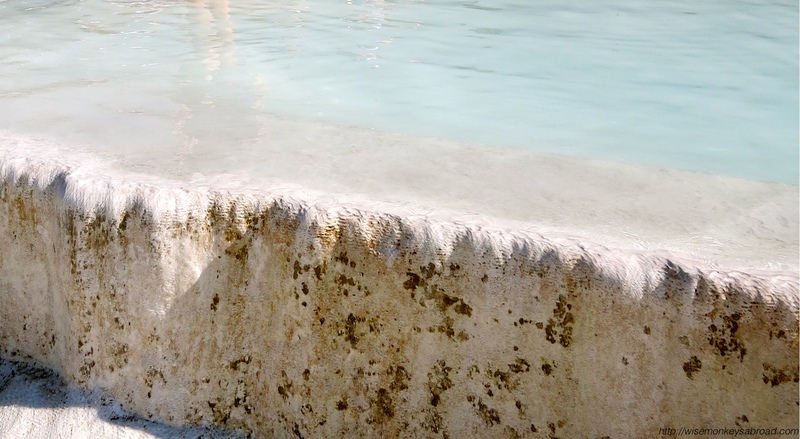 We hope the ones we have shared can give a little bit of insight into the beauty that is Pamukkale. 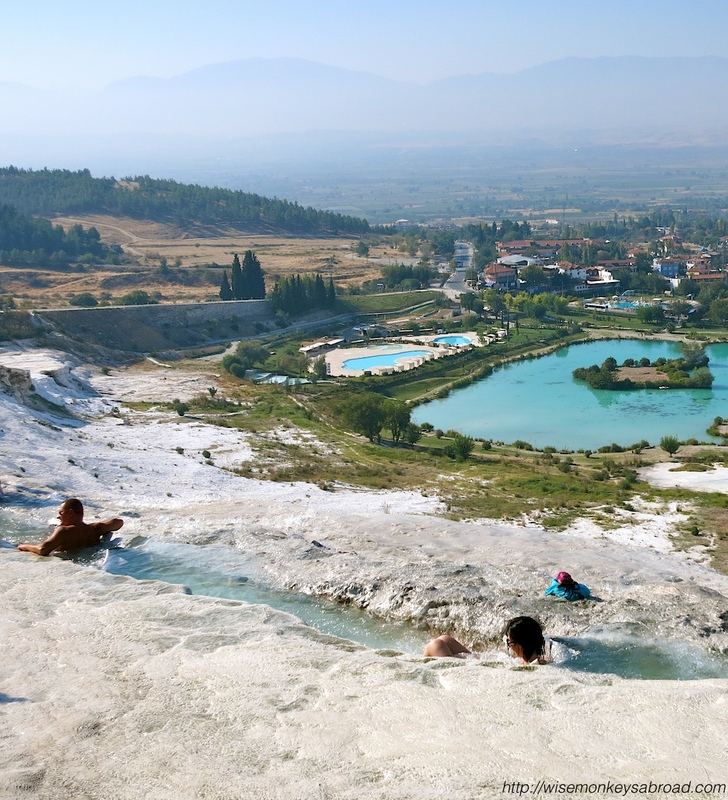 If you ever visit Pamukkale, there is also a swimming pool (with entrance fee) where you can swim among ancient ruins. We didn’t take any photos to share as that might’ve been a little creepy for the fellow pool-goers. 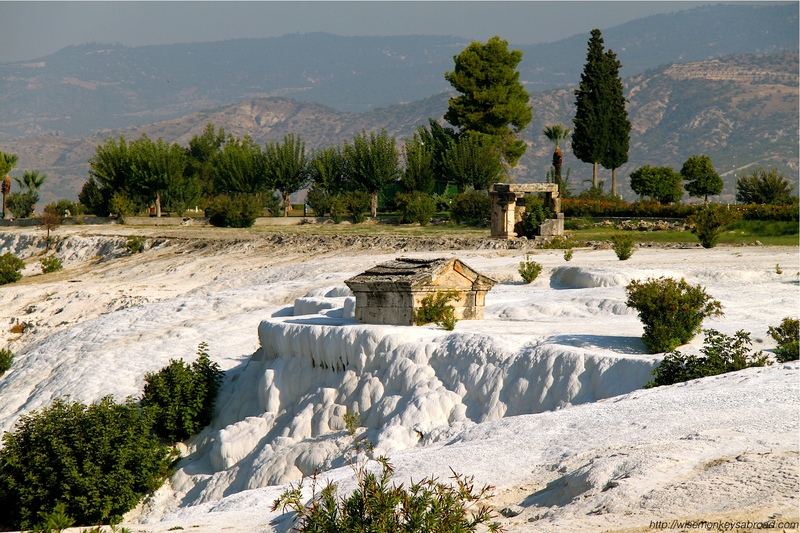 Wise Monkeys Trivia: Pamukkale translates to “cotton castle” and has an ancient city called Hierapolis built just above it. UNESCO Heritage site in 1988. As with all our posts, we welcome your comments and thoughts. 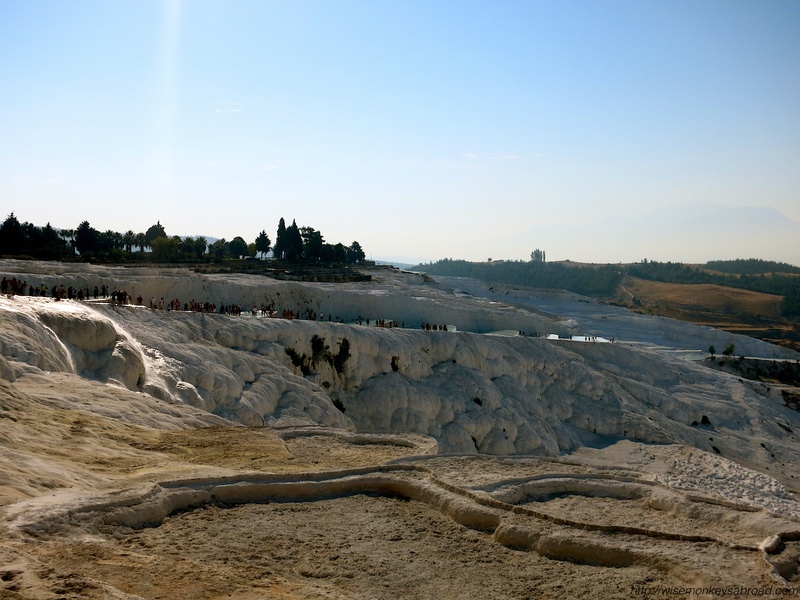 This entry was posted in General Travel Musings, Turkey, Turkey, UNESCO and tagged Pamukkale, Photography, Travel, Turkey, unesco, UNESCO Heritage Sites. It is definitely a must see! Hope you add it to your list 🙂 Thanks so much for stopping by and taking the time to leave a comment. Glad to have inspired you and we do hope you get to go soon. The beauty that is travel blogging, we are forever inspiring one another with different destinations. Such an amazing place! I enjoyed every moment although I did forget my swimsuit so couldn’t really enjoy the warm pools. LOL – we didn’t swim either but we waded through as far as our thighs! So if we had tripped and fallen – we would’ve been soaked through! It was absolutely beautiful there.. specially the view from the top. Now I have another new place to add to my list. 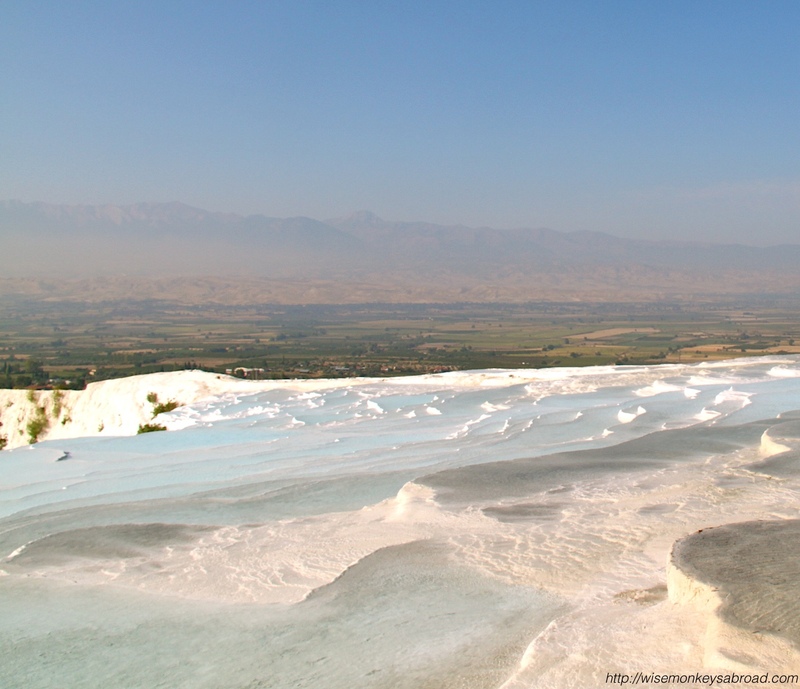 I haven’t heard of Pamukkale so I’ve really enjoyed your lovely photos. What an amazing place to visit. The pictures are amazing, looks heavenly! That first shot it fantastic! really gives a great overall view of the place, but man it was hot there, wasn’t it? I think the day we were there, it was something crazy like 43 degrees. 😮 Those pools were seriously refreshing, with all that heat and humidity. Yep! It was 30 something at like 10 am so we can only imagine by noon and the early afternoon how high it would’ve been hitting! The pools were unbelievably refreshing. Wow. This place looks surreal! Awesome landscape. I also thought snow at first, but 30 degrees brought me back to reality. I can imagine the reflected heat and glare. It does look like snow…. but goodness FAR from it! Sunglasses are a must on a sunny day! Ohh this has been on my list for so long… Absolutely stunning! Was it easy enough to get to?? I want to be there, just beautiful!!! That looks incredible! And I’d never even heard of that place! It’s shaping up to be that way – like every weekend here 🙂 Same to you! Allane, it was a little “pinch ourselves” kind of moment when we were there. We have wanted to visit this place for ages so when we were there, it was very exciting! Hope you have a great weekend! I hope you have a great weekend too!! 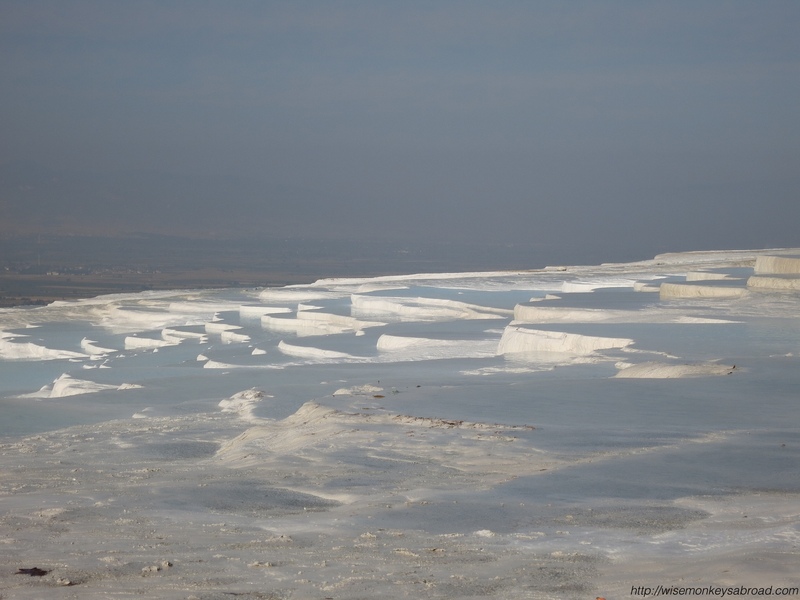 I agree – while it is not quite magical anymore (my guess is due to the number of people there), Pamukkale is still pretty cool. Though the sunset colours against the white stone were quite pretty. And my feet were lovely after walking through that mineral-rich water, lol. Slipping and sliding around, Monkeys. Glad that you brought your sunnies along, that limestone certainly looks blinding and can hurt the eye. But flip flops? 😀 That footwear is not something I’d wear to a tourist place or walking…but they are so comfortable! Thank you Mabel. We had flip flops because we knew we had to be bare foot in the pools so we chose the easy option for slipping on and off. LOL! We live and we learn that flip flops are not for everywhere despite how comfortable they are! Sending you wonderful vibes for the weekend and hope Melbourne is enjoying some summer weather! Weekend’s upon us, Monkeys. Have a good one! Have a fabulous weekend – we have JUST become aunty and uncle AGAIN so spending time with our new little nephew. It is well worth a visit … The TV and the books never really show the amount of people swarming of the opportunities for slipping in water lol! Hope you and your family enjoy the weekend ahead! Become came there, I thought it was snow. 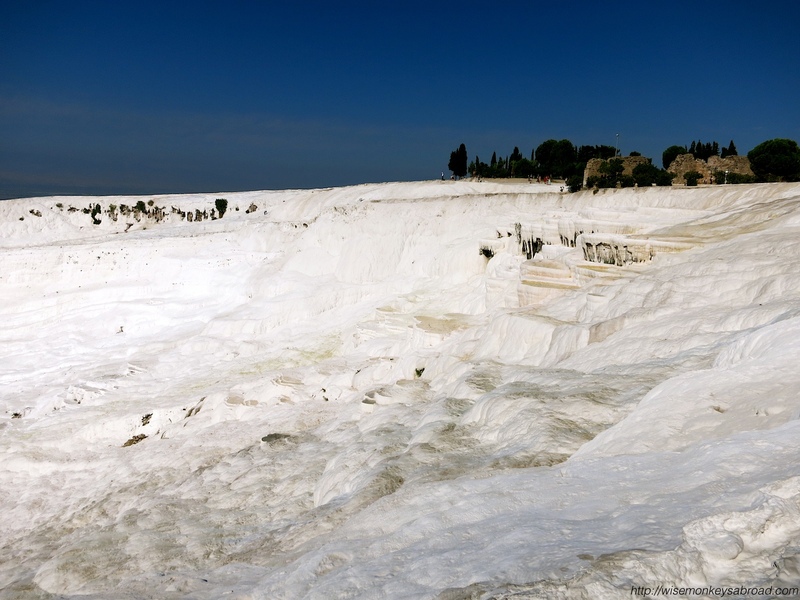 Amazing to see those white rocks and its spring. Did you try Cleopatra pool? It is a very unique landscape to see.